Open https://nextbulletin.miamioh.edu/courseadmin/ in Safari, Chrome, or Firefox. Note: this software is not compatible with Internet Explorer. Log in using your Miami UniqueID and MUnet Password (the same ID and password you use for your Miami email). For courses seeking both temporary and permanent approval, propose the course as temporary first. Once the course is approved for temporary use, edit the proposal and change the Temporary Course field from Yes to No and start workflow again. Before proposing a new course, search to see what course numbers are available under your subject by entering the subject code and clicking Search. To use a Course Code that exists in the course inventory table with a Deactivated status, you will need to select the course in the table (so it’s highlighted in gray) and click the green Reactivate button. This will take you to the editing form where you will enter the course data as a significant change. See Revisions to Existing Courses below, if you need additional instructions on the editing form. For a Course Code that exists in the course inventory table and is not deactivated, you will need to find another number because that course code is active and cannot be used. 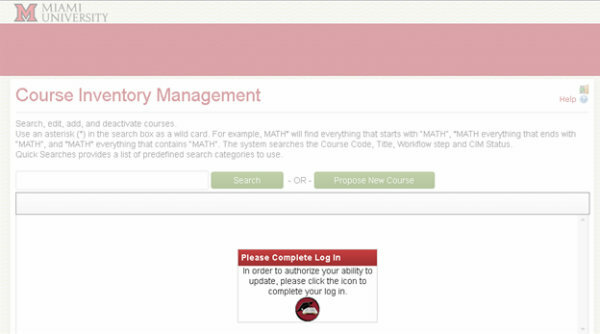 For a Course Code that does not exist in the course inventory table, you can select Propose New Course to fill out the proposal for requesting new courses. See instructions below for Cross-lists and 400/500 Dual-lists. To change a course number see Revisions to Existing Courses below. If you get the message below after entering the course number, close the form and do a search on the course code. The course code is either already in use or was deactivated and needs to be reactivated (see instructions above). All fields outlined in red require that an entry/selection is made in that field. A proposal can be canceled, saved (to finish at a later time [viewable to anyone]), or sent to workflow, for review and approval, by clicking the appropriate button at the bottom of the form. The Course Title refers to the short title (30 characters or less including spaces). The Bulletin Title refers to the long title (100 characters or less including spaces). Use the search bar to find the course you want to revise. Search tips are provided above the search bar. Select the course for revision from the course inventory table and click the green Edit Course button. When a course is selected from the table, you are shown how that course is used in the bulletin, by other courses, and by programs. This is called the ecosystem. When changes are made to a course, the departments in the ecosystem are notified. All editable fields outlined in red require that an entry/selection is made in that field. This will open up an additional section from which you can choose the area, or areas, for which you wish to propose. Once you check the box, or boxes, additional questions will appear. In addition to specific questions for each area, please use the “Attach supporting documentation” tab above to attach a copy of the new GMP course syllabus. All Foundation courses will ask you to describe briefly, what opportunities for Written Communication and Critical Thinking are present in this course and give examples of such an assignments. You may include a few sentences about how the course addresses the competency that are appropriate to include in a syllabus or simply refer to the attached syllabus. Rubrics for Global (FND IIIA and B) and Intercultural Perspectives (IC) courses can accessed using the links. Experiential Learning and Capstone proposals also have additional questions. Rubrics for each can be accessed using the links. For more information, view the Process and Timeline for Approval page. You may save and return to your work at any time. Questions: Contact Shelly Jarrett Bromberg PhD (Director of the Office of Liberal Education), 513-529-7136, jarretam@MiamiOH.edu. If you no longer want to move forward with a proposal that has been saved or sent to workflow, email courseapproval@miamioh.edu and ask one of the administrators to shred the proposal. When a course from the course inventory table is selected, you can see if any changes have recently been proposed, what those changes are, and what step the proposal is at in workflow. Go to the approval page using the link in your email notification. Select your role to view any course or program proposals waiting for your review (this is the same approval page where bulletin edits are reviewed and approved). You can see what edits were made and by whom. You can make additional edits, rollback to any previous step in the workflow (provide a comment as to why the proposal is being rolled back – this comment is public and will appear at the bottom of the proposal), or approve. All pages in Courseleaf have a Help resource. Click on the blue question mark for instructions and videos.